Now that you’ve created your own Virtual World, you need to put all the building blocks together to make it a success. This is what this Tutorial Guide will show you how to do. Every successful business venture begins in one place, your Brand. On your profile, under the ‘Manage World’ section, there is a tab labeled ‘Branding’. Click this tab, and you will see all of the options available to brand your very own Virtual World client, from the name of your Download, to the Desktop icon and the images displayed when loading different parts of the World. The most important part of your Branding process is the ‘Desktop Name’. You will need to set a name for your World, or people will not be able to download and enter your World. Once you set your Desktop Name, the download link for your World will be displayed below. This link is the most valuable piece of your VWW, as it will be your main promotional tool, and the link you will use to make your world the most powerful in the VWW! You can upload a regular image to any of the available slots, and it will display in the corresponding area of your Virtual World client. (Please consult the screen shots to see how each of these images will be displayed within your World). You will be paid for every new member you sign up through your network. But ONLY if you are a member of the Affiliate Program. Sign up, and start earning real revenue for people you sign up! After you have branded your World, set the Name, and received the download link, you will need to start adding the building blocks to your World. Under the ‘Add Property’ link, you will find dozens of properties available, some free, some with a set license amount every 30 days. Each property comes predesigned or vacant. If you choose a vacant property you will be able to design the look and feel of the property yourself through Prop Editing. Prop Editing is explained in more detail in the Tutorials link at the bottom of this page. You can purchase as many properties as you like, but only 2 Basic properties are provided at no cost. So you have your World registered, you have it Branded, and you have Added the Property you want to have in your World. Now, you have to link all these pieces together and make your Virtual World come to life! From your Profile page, click on ‘Manage Property’. Here you will see the ‘Transport Center’ you chose upon registration. These Transport Centers come with either 3, 5, 7, or 9 Exit Doors, also known as ‘Transport Pods’. You will own the ‘Pods’ on the right hand side of your Transport Center, and the Pods on the left hand side will be to Utherverse-sponsored. The ‘Primary Exit’ will be the main exit point of your Transport Center, which will be located directly in front of a user if they enter into your Transport Center. In the drop down menu underneath ‘Links To’, you will see all of the Properties you have added from the catalog. For each of the Pods available, select a Property from the drop-down list to link to. Below your Pod choices, there is a section for Branding your Transport Center. In this section, you can upload images, in the same way as the branding of your Virtual World client was accomplished. There are suggested size limits next to each of the branding options, but you don’t have to be a whiz in Photoshop to have your own Virtual World anymore! Any image uploaded will be sized to fit the available space in your Transport Center. Remember to ‘Save Branding’ at the bottom of this page, or else your changes will not be applied. You may want to simply save one or two images right away in these spaces, so that you can login to your World and see just how they are being laid out. They of course can be changed at any time, so never feel locked into your settings, as they can evolve alongside your World. (circled in red). Select the "My Home" link at the top. On the right is the Room Settings tab. This tab lets you lock out specific dimension and language combinations if you are not there. To do this, just pick the desired combination of dimension and language and check the box below it. If the “Lock if I’m away” box is checked for a specific region/language combination then that combination will not open without the presence of your avatar. In the bottom right there is a “Cover Charge Settings” box. Click on enable to open the menu. Ticket Lasts - The ticket will be good for this time period. 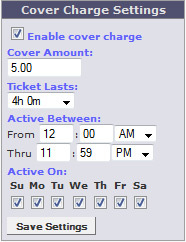 Active Between - This is the time period (In Pacific Time) that the cover charge will be instituted in the club. In managing your region you will need to create lists that you can add specific functions to such as Prop Editing or Booting. For example creating a Prop Editor list and a boot list would be a good place to start. Go in the List Management box and name your list. In the example below the list has been called “Prop Editors”. When you click ‘Go’ the box will open and allow you to add usernames. Type in the name of the user and click ‘Add’. Their name will appear in your list. If you would like to create a boot list, the same process is followed, but it should be named something like ‘boot’ or ‘kick’ so that you know who should be on that list. This does not enable those on the list to Prop Edit or Boot yet, it simply connects names on lists so that you can enable rights. Now using the lists you have created you can set the permissions for those lists. In the example below the list created above, the user has set “Allow” for “Prop Editors” to “Decorate”. Click on Create to finish setting the rules. Using “Allow” will give a user an Action in your regions. If you would like to remove an action then select ‘Deny’ in the menu. Blocking Users from Regions - “Deny” is used for those you wish to deny entry to a user. For example in List Management, create a “Blocked” list. Then set your House Rules to “Deny” “Blocked” “Enter the House”. Finally, some helpful hints are posted at the bottom of the page so check there if needed. To create a link between your properties, you will need to place doors within those properties that can be used as ‘jump points’ to move around your VWW. Prop Editing is the term for moving the in-world objects around and/or adding functions to them. Click on the 'Add' prop icon to Add a new prop. A menu will pop up that lists all the props available. Type “door” in next to ‘Keyword:” and click ‘find’. Select the first ‘door’ on the list and then click ‘create’. A Red door will appear. Many doors can be used but for this initial setup, it is best to keep it simple. You have now created the door. As it is created hovering in mid-air, you likely will want to place this door in a different place or position that it initially appears. Left Click on mouse when done. Now, you will need to set this door up to lead to one of your chosen properties. This can be done through use of the ‘Move to VWW Url’ Script. You can also find the Url’s for any of your properties under the ‘Manage Property’ section of your Business profile. Now that you have set up a door in the proper location using the steps listed above, you will now need to attach that ‘Move to VWW Url’ Script, to make that door exit to one of your other properties. After you have finished placing the door, click on the ‘Script’ tab along the top of the Prop Editor window. From the drop down menu there, choose ‘Move to VWW Url’. You will then see a box where you can enter the Url of the area you want that door to go to. Paste or type the VWW Url of the chosen property into this box. Hit the ‘Save and Release’ icon. Close the Prop Editor window by hitting the small ‘X’ in the lower right hand corner of the window. Now left-click on your door, and check that you land in the proper, selected area. If you do, then you have set up your door properly! If not, please try repeating these steps, and if you still are having issues, send an email over to support@utherverse.com for further assistance. One of the most important parts of a successful World, much like the internet in its early stages, is traffic. A lot of the successful sites that built themselves up did so on the foundation of link trading and traffic sharing. In the VWW, you can do the exact same thing, through a feature called ‘Door Trade’. Above, you’ve learned how to Prop Edit a door into your Property, but here, you will learn how to use those doors to their full potential. The Door Trade function will allow you to auction off a door in your World to another World owner, Business owner, etc, who will bid to have that door go to a property they own. If your World has a high traffic volume, any door you place inside your world and put up for auction will be more valuable than a World with less traffic, just as ads or links on popular websites are more valuable than those on a smaller, less visited sites. a) Place a door in your chosen property, following the same steps as the example above. b) Then, on the Prop Editor window, choose the ‘Plugins’ tab, which is to the far right. On the drop-down list, choose ‘DTrade’. c) Then, set the amounts for how much you would like to auction the door for, and for how long you would like a successful bid to last. d) Then hit the ‘Save and Release’ option on the Prop Editor. Close the Prop Editor window, and you will see a small sign on the door that says ‘To License This Door Click Here’. Anyone who clicks on this link will be brought to a webpage where they can place a bid on the door. If someone places a bid on one of your doors, you will be notified with a message to your Profile, alerting which property, and which door has received a bid, so you can review the bids and select the one you want that door to link to. Any bids on your door can be viewed by selecting ‘Doors’ from the ‘More’ tab within the ‘Manage Property’ section of your Profile.